Each Elks year, the Trustees of the Orange Elks Lodge make a budget for the coming year and a line item in that budget is Lodge Charities. This calendar year the budget was $23,500. 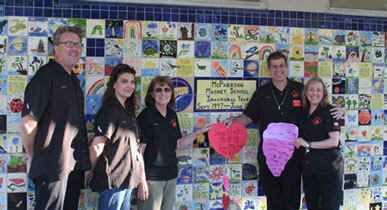 Each month the trustees went over and approved requests to local charities and organizations. Here are a few of the forty eight benefactors. The NTAF Southwest Spinal Cord in the name of Zack Collie, McPherson Magnet School to help improve its kindergarten playground, HomeAid whose mission is ending homelessness for children in Orange County, Mary's Kitchen and Mary's Purse that feeds and assists the local homeless, Threads of Love a sewing ministry that meets the needs of newborns and tiny premature infants (NICU), the Ronald McDonald House that helps children and supports their families, CHOC (NICU) which provides newborns needing critical care, most often premature babies suffering from respiratory and circulatory problems, the police dog fund for veterinary bills for retired police dogs that the lodge has purchased for Orange P D, the Eli House, the Orange H S Choir, Walk for Wishes whose Mission is to "Grant Wishes for Children with Life Threatening Medical Conditions to Enrich the Human Experience with Hope, Strength and Joy." 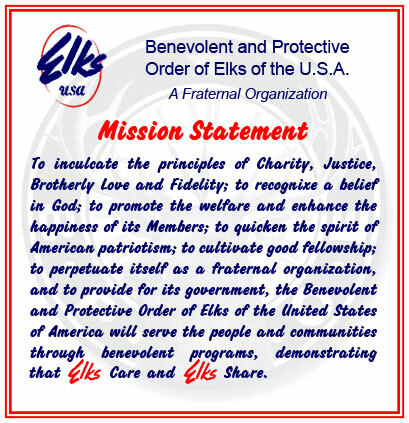 The Orange Elks Care and the Orange Elks Share"! Zack was a typical 15 year old teenager living in Southern California. He enjoyed hanging with his friends, playing on-line video games, dirt-biking in the desert, camping at the Colorado River, watching movies, texting his friends, and going to the beach. Zack was on his high school wrestling team. On May 31, 2010, Memorial Day, Zack Collie sustained a life-changing injury. While bodysurfing at Newport Beach, CA, he broke his neck at the 4th vertebrae and damaged his spinal cord. He was immediately paralyzed, fully conscious, and floating face down in the surf. Fortunately for Zack, his friend Travis was close, turned him over and got him to the beach, saving his life. He was rushed to Hoag Hospital. The rest of 2010 was tough! Photos from before the accident are a little hard to look at. Looking at Zack and seeing him becoming a young man, watching his leadership personality, he is decisive and determined when he sets his mind to something he does it. He is not a complainer and has NEVER once complained about his injury. He gets frustrated or upset at the circumstances but has never ask "why". Zack continues to show us how amazingly strong he is and has an unwavering focus since the day of the accident. Zack took a trip to Las Vegas over the Thanksgiving holiday in 2010. On Christmas eve Zack was able move his two big toes!! 2011 Year of first's. Zack is coming up on the one year anniversary May 31st (Memorial Day) of his beach accident. He has not visited the accident site 42nd St in Newport Beach. However, he sees the ocean each day he goes to Carlsbad for his physical therapy. Yes, Zack went to Disneyland! If your wondering if he went on rides?? YES he DID! Of course he wanted to go on anything fast! His mom was a little apprehensive, considering the circumstances BUT with much careful thought he was able to go on Indiana Jones (definitely the most difficult), Thunder mountain (glad mom was there to hold his legs that wanted to keep going to the side), Space mountain (the ride that would be the hardest, turned out to be one of the best) and Soaring in California Adventure (Zack's favorite) and last but not least Tower of Terror which Zack loved. In August Zack was able to stand for over a minute as his legs and core are continuing to get stronger. Zack ended the summer with a trip to Knott's Berry Farm. Zack went once earlier in the year but was not able to go on any rides, so this time he was ready! Back to School after being gone two summers and having missed his sophomore year, Zack is "Back to School" as a Jr. He goes (3) days a week to Yorba Linda H.S. and still goes to Carlsbad for physical therapy (2) days a week. He has a teacher come to the home to help him with school work. Zack's favorite part of school is 6th period wrestling where he helps keep score and gets to hangout with friends. At Homecoming, Zack was voted Jr. Homecoming Prince for 2011. He wasn't sure what to think at first but it ended up being a fun experience. Pictures were taken, practice runs made, two pep rally's the day of the homecoming game then that night was the football game where Zack & court went out to the field at half time. Y L won the football game! Zack was awarded a scholarship to go to an adaptive ski school in Durango Colorado for 6 days! He was excited and nervous. It was a incredible experience. Memorial Weekend would be the second anniversary. Optimism! Zack had been injured for two years. He has shown amazing strength in the mist of a huge life-altering tragedy. That summer, Zack turn 18 and got a tattoo. The tattoo, "In the Hands of God" has a multiple meanings. It was Zack's favorite song before injury and has even more of a meaning now. Summers over and Fall is here and Zack has decided this year he is going to apply to a four year school and try to live on campus. He will be applying to CSUF. He toured the campus, talked with the disabled student department and housing and could potentially be the 1st quadriplegic to live on campus! Saturday, November 3, 2012 was big! Zack went "back to the beach" for the first time back since his injury. He was fine and is so mentally strong and enjoyed a great family night with friends. Zack and his family went on their first cruise to Mexico. Zack got "the call" from Canine Companions the service dog facility in Oceanside. Zack's been on the wait list since January. Zack and his mom lived there in February for twelve days of training and returned home with a K-9 companion named Sedona. He also has a new fitness center closer to home and goes once a week. Zack will be going to CSUF in the fall. Zack decided at the last minute to walk and get his diploma. He was nervous and it was hard to see but powerful and in the end he was very happy he pushed himself! "After all you only walk to get your high school diploma!" Another one of those times when no words are necessary! I'll let the video speak for itself.... Zack "walks" to get diploma! Team Cancer Schmancer, led by Orange Elk Leah Glastetter, participated in Relay for Life at Orange High School in May 2010 to raise money for the American Cancer Society. 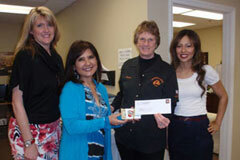 The team, which was supported by the Orange Elks, raised $1,596. On Friday December 18, the Kitchen Crew prepared a spaghetti dinner for over 200 Orange Elks Lodge members, their families and friends. After dinner we packed 193 Christmas baskets for selected families in need in the city of Orange. The baskets included everything for a wonderful Christmas dinner. Toys for the children were also included. On Saturday December 19, 74 Elks members, their family and friends met at the lodge and delivered the Christmas baskets. The lodge raised nearly $5000 to provide the baskets for this wonderful Christmas event for the holiday season. The Orange Elks Lodge Scout Troop 1475 is a big part of this program. Larry Loustaunau, Asst. Scoutmaster of Troop 1475 and his son Robert are pictured loading vehicles. Later, they delivered the Christmas Baskets. See photos of this event here. Seventeen members of the Orange Elks Lodge visited the Long Beach Veterans Hospital to treat 21 Veterans to a Christmas in July. 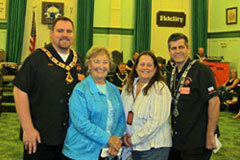 Elks from several other lodges in the Orange Coast District were also there. The lodge provided $100 dollars for Bingo, a gift bag that included toiletry gifts, an American flag, an hand written card that said "Our vets will never be forgotten. Thank you for your service. God Bless you and God Bless America" and included a five dollar bill. Every veteran won at least $5.00 in Bingo. This is a special program our lodge does to show our appreciation to the veterans for their part in keeping our country safe. 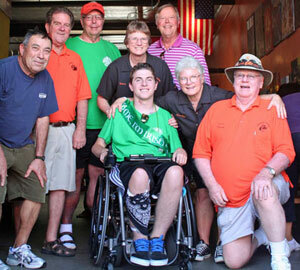 More than $2,947,853 has been contributed this year by members of Elks Lodges throughout California and Hawaii to be used in treating children with disabilities. Rick Hatch, Exalted Ruler of Orange Lodge 1475, of the Benevolent and Protective Order of Elks, contributed $11,730.91 which was raised by the members of the Lodge. "We are pleased and proud that members of our Elks Lodge were so generous with their dollars and time in this important undertaking," Rick said. Since 1950, the 94,000 members from throughout California and Hawaii have turned over more than $88,000,000 to the California-Hawaii Elks Major Project, Inc., which administers the non-profit charitable corporation. All of the funds are devoted solely to providing vision screening and therapy treatment to children with a broad range of disabilities. 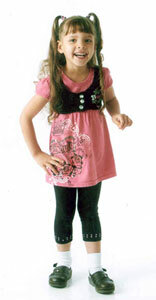 Without the Elks supported donations, many of these children would not receive such treatment. The year-long fund raising campaign is capped by an impressive ceremony at the annual Elks Convention when representatives of lodges from throughout California and Hawaii present their donations to Major Project and Elks Association leaders. The raising of funds to aid children with disabilities is just one of the many philanthropic and patriotic projects which mark the Elks' contribution to our community. CHILDREN BENEFIT - Three and one-half old Mia Burton of Redding, California was the Theme Child at the California-Hawaii Elks Major Project's Exalted Rulers' March on Saturday, May 16, 2009, at the California-Hawaii Elks Association's Annual Convention in Ontario. A check for $11,730.91 was presented by Rick Hatch, Exalted Ruler of Orange Lodge 1475, to John Holt, Chairman of the Major Project Board of Trustees. 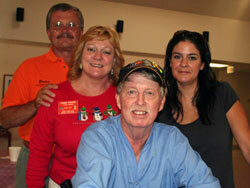 Nine members of the Orange Elks Lodge #1475 showed up at 6:30 am and cooked sixteen turkeys for Mary’s Kitchen. 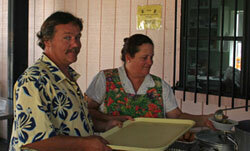 Mary’s Kitchen feeds the homeless and those in need. The dinners with all the trimmings fed 179 people. According to Orange Elks member and Mary’s Kitchen volunteer Sue Siegal, in the last four months Mary’s Kitchen has seen a 400% increase in meals served. 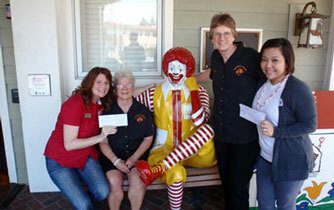 The Orange Elks Lodge # 1475 cleaned out the charity pot and donated to several charities in Orange County. 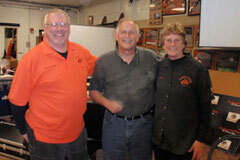 The Orange Elks PER Association donated $500 to ENF, Purple Pig and the Discovery Arts. Michael O'Donoghue, Orange Elks Lodge Scouting leader, was very busy with the lodge's scouting troops this month. In the picture, WEBELO Scouts from Den 5, Pack 1475 charted by Elk's Lodge of Orange, are working on their Community Service Project to obtain their Citizenship pin. The boys assembled activity kits for the children at Childrens Hospital of Orange County. 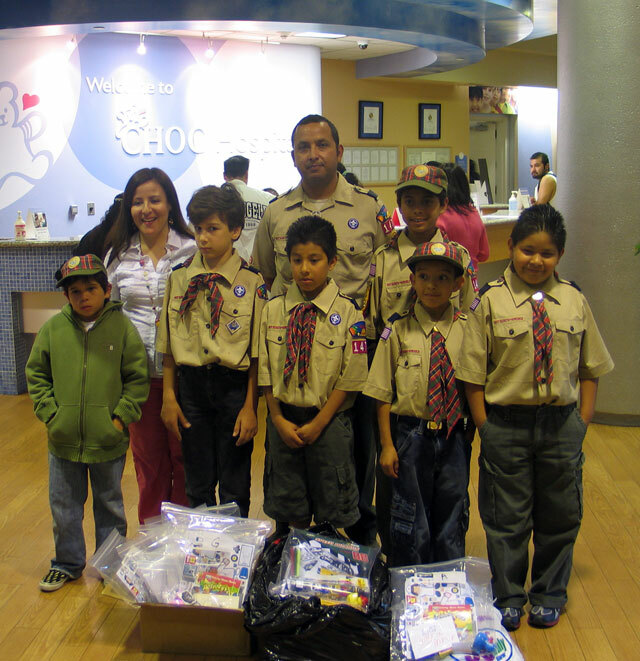 Left to right: Tony Villegas; Edith Alvarez, CHOC Child Life Specialist; Joshua Deight; Gonzalo Delgado, Den Leader; Jesus Mejia; Brian Delgado; Dilan Reyes; and Pablo Abarca. Not shown are Jordan Green and Mauricio Guitierrez.